Trends such as workshifting and bring your own device (BYOD) are putting more pressure on IT and a growing global workforce and the need to collaborate and share data with third parties, customers and partners add to this chaos and complexity. Users have increasingly turned to unsecure, consumer-style cloud services for access to their data and files across all of their devices. 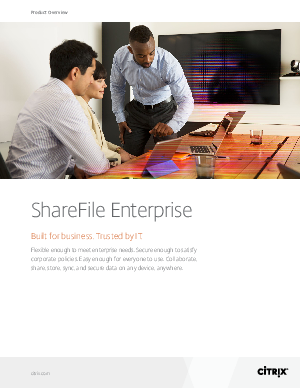 To help IT regain control over employee file sharing, Citrix offers ShareFile—an enterprise-class, IT-managed, secure file sync and sharing service. ShareFile offers IT the ability to control sensitive corporate data while meeting the mobility and collaboration needs of users. Download white paper and learn more.